OMG, what a FUN necklace! Today, the city feels not that different but there have already been a few wtf moments, like the halt of a Luzhkov-backed construction project on Borovitskaya Ploschad’. This was later overturned by the Kremlin, but the sense of the city’s cleansing of Luzhkov — or Baturin, as he’s jocularly known — was unmistakeable. And then he laughed and laughed? 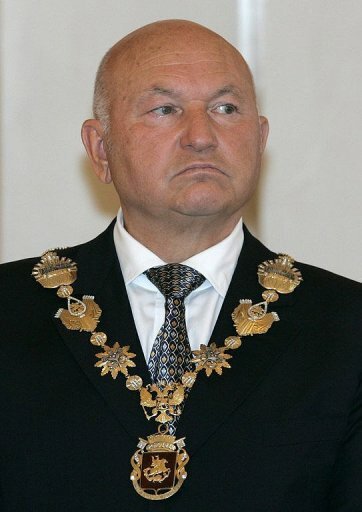 This entry was posted in Uncategorized and tagged fired, gay rights, gays, protest, Swiss Airlines, Yuri Luzhkov. Bookmark the permalink. This is great news, but it does seem worth noting that they’re not being permitted to conduct a gay pride march. It’s a slightly less controversial rally against the alleged actions of an airline. I don’t think this erases the significance of the official permission, but it possibly diminishes the achievement. I’ll be interested to see if “gayer” public activism is sanctioned in the months to come. I couldn’t agree more. But this is still unprecedented, as is the fact that Sledstvenny Kommitet is using Nemtsov and Zhirinovsky’s accusations against Luzhkov — which were found to be libelous in court — to launch an investigation into Luzhkov’s dealings. I mean, WTF? Land of extremes much? I would absolutely love it if Putin’s advisors were able to grasp that gay rights is an issue that could immediately and forever change people’s perceptions of Putin around the world. It’s soooo obvious. There is almost no downside except amongst those Russians who are homophobes (a tiny minority of Nationalists and knuckleheads who have no power and don’t vote). The upside is awesome. Rebranding Putin as someone with a modern sensibility and a degree of open mindedness. The one quality which so often gets lost in translation is Putin’s ability to poke fun at himself. Putin will never be questioned about his toughness or intelligence. Thus, the embrace of such an issue would throw everyone off balance and infuriate his critics. Then Putin should invite the leading gays in Russia to a luncheon the day before the parade. The impact of such a bold and unprecedented move would do more to rebrand the “new” Russia then 20 Ketchum PR agencies could ever hope to do. I wish his website had a contact address. There are lots of great ideas every day that would completely change international perception of Russia for very little investment, and this is one of them. q...I would absolutely love it if Putin’s advisors were able to grasp that gay rights is an issue that could immediately and forever change people’s perceptions of Putin around the world. .